Every year on July Fourth, America observes the anniversary of the nation’s independence. There are plenty of ways to partake in these celebrations, though some methods tend to be more popular than others. Here are a few different ways to enjoy yourself during this year’s festivities in a handful of cities across the country. The United States of America is a relatively young country, but has been involved in many defining moments of the globe’s last few hundred years. Being free has come with moments of triumph and times of sorrow, and nowhere are both memorialized in number as they are in Washington D.C. If you’re looking to gain some insights into our Nation’s history, museums like the National Museum of American History or the Smithsonian National Air and Space Museum can each offer more education than a single day allows. Those looking for a respectful sense of nostalgia can take in the memorials and monuments like the U.S. Marine Corps War Memorial (Iwo Jima), the Women in Military Service for America Memorial, or the Vietnam Veterans Memorial – and many, many more. The capital of this country is rich with historical significance, making it a wonderful place for those looking to gain perspective this Fourth of July. It would be difficult for anyone to go to the Miami area and not have a good time – Independence Day is no exception. For over half a century, the city of Key Biscayne (just across the water from Miami) has been holding their annual 4th of July parade. Members of the community participate in the event with floats created by all who’d like to participate – there’s even a prize for the best float! (And if you like fireworks, be sure to stick around after the parade to partake in the ongoing festivities as the skies light up). Bookend your trip with any number of activities. From wine tasting to beach bumming, South Florida has you covered. You’ve probably heard it said “everything is bigger in Texas,” but is that true of fireworks shows as well? There’s only one way to find out: visit Addison “Kaboom! Town,” Texas. Located about 13 miles north of Dallas, Addison boasts a nighttime display that lives up to its name. Over half of a million attendees make the trip each year to enjoy the celebratory evening explosions. Attendance is free, but admission to the event is stopped once the venue reaches its limit, so plan ahead! If you hail from the northwestern region of the U.S., perhaps a trip to Caldwell, Idaho is worth taking. 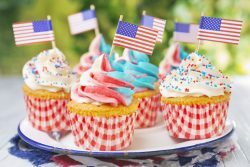 The town puts on an all-day picnic complete with a parade, a car show, activities for kids, live music, an apple pie-eating contest (is anything more American? ), and, of course, fireworks to end the day. Other Idahoan Independence Day events include the Chalk Art Festival in Boise, Melba’s “Olde Tyme” 4th of July Celebration, and yet another all-day event in Crouch, which includes a pancake feed, games for kids, a river raft race, and a nighttime parade. Whether you decide to travel this Independence Day, or stay close to home, be sure to celebrate safely and enjoy your time with friends and family. What Can and Can’t They Eat? Cool off with these homemade ice cream recipes this summer!